The amazing queen of colors & coloring Kathy at Lily Pad Cards has come up with again a wonderful Palette of colors for the August challenge. I really love this - blues & brownies - yummy! 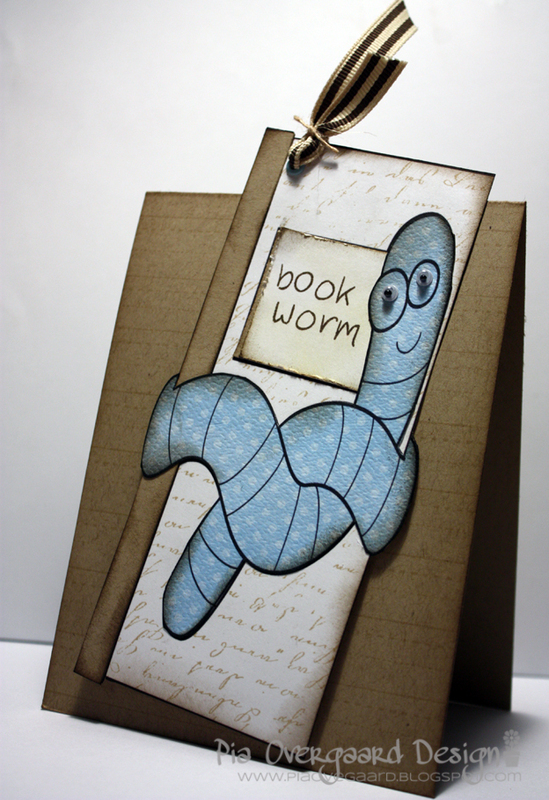 The Design Team members got some Whimsie Doodles images from their August Release to work with and I chose the book worm for my inspirational card. I printed the digital image twice - once on white cardstock and then again onto some Bo Bunny Double Dot cardstock for a bit of paper piecing (btw, I resized the image to fit a bookmark size). The white image was stamped with Hero Arts Old Letter Writing and the edges were all distressed using walnut stain ink. Supplies: Whimsie Doodles Digital image Book Worm, Hero Arts Old Letter Writing, Hero Arts Notebook paper, Bazzill papers, Bo Bunny Double Dot Powder, Google Eyes, Ranger walnut stain distress ink. Go to the Pond to check out the challenge and the amazing creation of the DT members!! Super lækkert kort... flot opsætning i skønne farver. Årh hvad det er sejt! Jeg er helt vild med ormen.